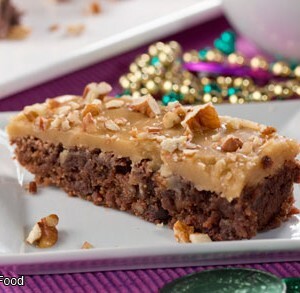 Everyone will be cheering you when you bake up a batch of our "salute to New Orleans" Big Easy Brownies. Whether for game-watching, movie night, a potluck or bake sale, these awesome brownies will always score you big points! Preheat oven to 350 degrees F. Coat a 9- x 13-inch baking dish with cooking spray. Stir 1/2 cup pecans and the chocolate chips into prepared batter. Bake as directed, 25 to 30 minutes; cool completely. Meanwhile, in a medium saucepan over medium heat, combine heavy cream, butter, and brown sugar, stirring frequently, until mixture comes to a boil. Continue cooking 1 minute, stirring constantly. Remove from heat. Whisk in confectioners' sugar and vanilla. Cool 5 minutes, stirring frequently. Pour frosting evenly over brownies. Sprinkle remaining pecans over top. Allow to stand 30 to 45 minutes, or until frosting is set.